Broadview has recently decided to more clearly identify and track some of our social and environmental goals, beginning with one particular area: the type of paper being used in our books. A number of environmental organizations (most notably the Environmental Paper Network and Canopy) have gathered data on the environmental impact of different sorts of papers, ranging from those made of virgin fibers to 100% recycled paper. 100% recycled paper is the ideal, as its manufacturing process not only uses fewer trees than virgin fibers, but also uses less energy and produces less wastewater and solid waste pollution. Another factor to consider is Forest Stewardship Council (FSC) certification. FSC is a global not-for-profit organization that sets widely-recognized standards for the responsible management of forests and wood products, both environmentally and socially. FSC-certified paper may be composed of virgin tree fibers, recycled materials, or a mix of the two. Our printing program uses the following order of preference when selecting paper: 100% recycled and FSC-certified paper is our first choice, partially recycled and FSC-certified is our second choice, FSC-certified virgin fibers is our third choice, and paper that has neither recycled content nor FSC certification is our last resort. We have recently begun tracking the number of titles and pages printed annually on these different types of paper in order to document more precisely our current practices and to encourage us to increase our use of environmentally friendly papers. For many years now, nearly all Broadview books with paper weights of 40lbs or greater (what is considered the “standard” paper weight range for books) have been printed on FSC-certified and at least partially recycled paper, with the majority of these being printed on 100% recycled paper, whether or not this meant incurring additional cost or choosing a slightly less aesthetically pleasing paper (it should be noted that recycled 47lb paper from our primary printer is less expensive than non-recycled paper, though the opposite is true of our other printers); credit should go to our Managing Editor, Tara Lowes, for applying this printing policy. 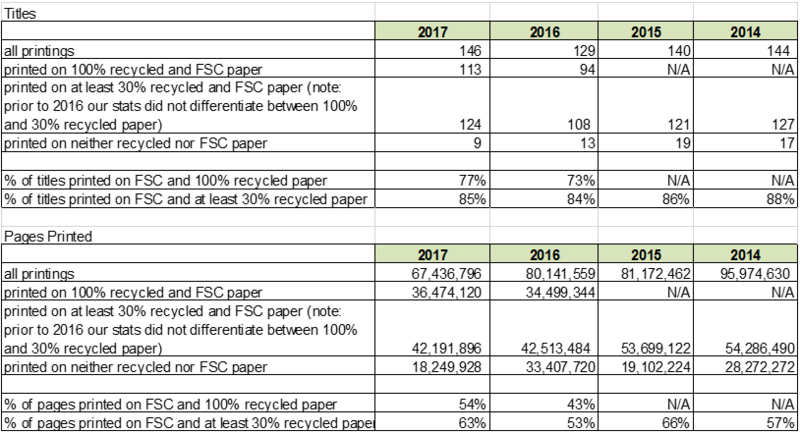 As the figures below show, however, while the number of individual titles (including both new titles and reprints) printed on recycled and FSC-certified paper is fairly high, ranging from 84-88% annually, the number of pages printed on recycled and FSC-certified paper is much lower, ranging from 57-66% of all pages printed. The barrier we’ve come up against is that longer books such as the Broadview Anthology of British Literature, The Broadview Introduction to Literature, and The Broadview Anthology of Social and Political Thought, which have high page counts and are often printed in large quantities, must use very thin paper of a weight less than 40lbs in order to remain reasonably light and portable. There is very low demand for recycled or FSC-certified paper at weights under 40lbs, and to our knowledge it is not available from any Canadian printers. Given this availability problem, it does not seem likely that we will be able to increase the percentage of Broadview pages printed on recycled and FSC-certified paper in the near future, though we remain committed to seeking these options wherever possible. Going forward, we will continue to track our own printing practices and monitor changes in the availability of low-weight environmentally friendly papers.